Kutaj (Holarrhena antidysenterica Wall) is a glabrous tree or large shrub found throughout the deciduous forest areas of India at low elevations and up to 1100 meters in the tropical Himalayan tract. The seeds of the plant are known as Indrajau or Indrayava. The seeds and stem bark of tree is indicated in many diseases such as piles, malabsorption symptom and particularly in diarrhea and dysentery. The bark has anti-diarrheal, constipating, astringent, anti-dysenteric, anthelmintic (kills parasitic worms), carminative and digestive properties. The powdered bark when taken in a dose of 3 grams with buttermilk, twice a day gives relief in loose motions. For the medicinal purpose the bark of 8-12 years old trees are collected in July to September and again at the end of winter. Scientific studies have established the anti-protozoal, anti-giardia and anti-amoebic properties of Holarrhena antidysenterica. 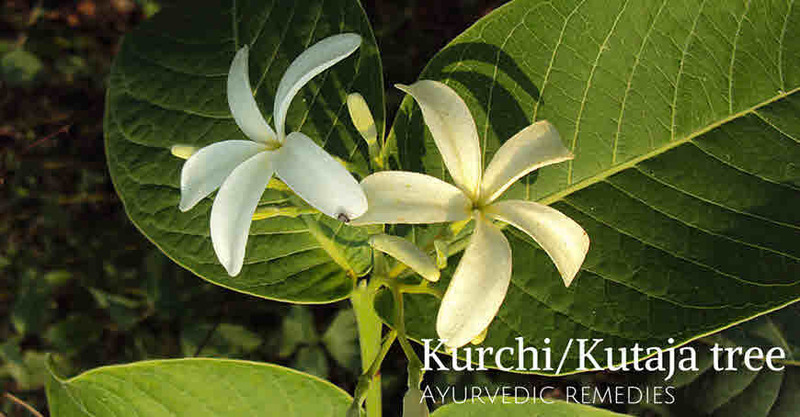 Read more about Kutaj Ayurvedic remedies. Habitat: Kutaj (Kurchi) or Holarrhena antidysenterica is a plant native to tropical Himalayas. In India, it is found in Indian forests. For the medicinal purpose the seeds and bark are used. The dried seeds are known as Indrayava, Bhadra Yava (Sanskrit), Indraju (Hindi), Kodasige Beeja (Kannada), Kudayache Beej (Marathi) and Conessi Seeds (English). Alkaloids, regholarrhenine-A, -B, -C, -D, -E and -F;pubescine, norholadiene, pubescimine, kurchinin, kurchinine, kurchinidine, holarrifine, holadiene, kurchilidine, kurchamide, kurcholessine, kurchessine, conessine, conessimine etc. Karma/Action: Deepan (Digestive stimulant, the action of kindling agni), Anti-diarrhea, pacifies Tridosha. Stem bark is the main ingredient in Kutajaristha, Kutajavaleha and Kutaj ghan vati. Seeds or Indrayava are used in preparation of Piyushvalli Rasa, Pancha Nimba Churna, Laghu Gangadhar Churna, Krimi Kuthar Rasa, Ahiphenasava. Kutaja has bitter, pungent taste and cold in potency. The bark has an astringent, anthelmintic, amoebicidal and diuretic activities and is useful in treating diarrhea, dysentery and amebiasis. Kutaj is useful in treating diarrhea, dysentery (atisaar, dast, Sangrahani) and other such digestive system ailments. For treating these ailments you can take Ayurvedic medicine Kutaj Ghan Vati which is prepared from bark of Kutaj. Kutajarishta is also prepared from bark of Kutaj and can be taken in a dose of 15-30 ml with an equal amount of water after the meal. Kutajarishta is useful in treating Grahani (malabsorption syndrome), Pravahika (dysentery), Raktatisara (diarrhea with blood) and Jwara (fever). If Kutaj bark is available then prepare its powder and take 3-5 g and for children 500 mg to 1 g, twice or thrice daily with warm water, before the meals. Boil bark in water, add salt and apply at inflamed joints. Take powder of Kutaj bark (10 gm), harad/haritaki (10 gm) and sonth/dried ginger powder (10 gm). Take this powder (1 tbsp) twice a day. This gives relief in pain due to arthritis, gout and joint inflammation. It also improves digestive function. Kutaj causes constipation. So this combination helps in controlling that effect of bark. Collect the seed (Indrajau) clean them. Dry in shade. Grind to make powder. Mix this powder with Ashwagandha powder in 1:2 ratio. Add misri and take 1 tbsp twice a day for a few days. Soak Kutaj bark in water at night. Next morning drink this water. Soak bark (2 tbsp) in glass of water at night. Next morning drink this water. Take its bark powder (2 gms). This is helpful in stopping bleeding in Shonitarsha (Bleeding piles). Boil its bark in water and wash affected areas. In Ayurvedic treatise, there is no mentioned side-effect of Kutaj. Various studies have also confirmed the same. Kutaj may cause distension of the abdomen after using for a few days. Kutaj is constipating, so as soon as diarrhea is cured, stop using Kutaj or kutaj containing products. In high blood pressure, it should be taken under medical supervision.